Fifty years ago this month, I remember returning from home after summer holidays to Vivekananda hostel for completing the final year of my degree course. Soon we settled down in the new rooms allotted to us, and the classes too picked up momentum, indeed got into full swing. Having got used to the new routine … one evening as the Sun was retiring for the day, my roommate and I walked out of the hostel towards the pavilion. “Oh! Come on, don’t be smart…Are you still for Entomology or changed your mind during the holidays?” he questioned casually. “Why re, won’t you go for PG? Giving up all your craze for Organophosphates, neurons, axons, dendrites, synapses, AChEs, AChEIs … teaching pest co…. ?”— so continuing he was … but I had already been carried away from him by the magical voice of Kishore Kumar from Radio Ceylon … exuberant strain ... romance .... flowing gently … “Gata rahe mera dil tuhi meri manzil” … with such an ease and élan and just hitting the right chord … followed by an equally magical saxophone humming … starting too softly and gracefully reaching the high octave … and then came that usual deep baritone announcement of Ameen Sayani, of course, with a touch of melody … “Navaketan International presents … Guide”. Right … they had a radio … all the songs must be catchy—what else you expect when SD Burman and Dev Anand’s Navaketan join hands? Of course, at home, I did read about the making of Guide by Dev Anand, based on R K Narayan’s novel of the same name, in Hindi and also in English, with Pearl S Buck as the Co-producer … and the kind of displeasure the writer of the novel, RKN, aired over its overblown canvas—particularly, of the lives of the ‘hemmed in’ characters. … and so on. Yet I was so excited, for I heard the song for the first time … and it just sounded as though Dev himself was cooing. Indeed, the ads in Cine Advance and Screen too were quite novel. The entire central spread of the paper was left blank except for a small snapshot of Dev Anand — if I remember rightly, only his face — on the top left-hand corner of the page, and on the right-hand bottom corner, a wooden post with labels written Agra, Delhi, Jaipur on them and below it Guide — A Film by Navaketan International. Very typical of Dev’s novelty! Coming back to the song “Wahaan Kaun hai teraa”, I must not forget to say that it had some mesmerizing flute bits of that well-known Manohari Singh in between the lyrics: “Beet gave din / pyaar ke palchhin / … bhool gave wo / tub hi bhulaa de.” Indeed, as the enchanting Manohari Sing’s flute slips in and out of Burmanda’s inimitable nasal voice, rasping but melodious voice reciting the lyrical poetry of Shailendra, you feel it’s a duet by Burmanda and flute. 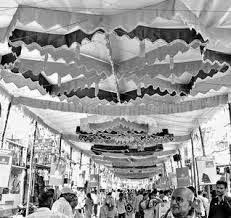 Singing in a folk style and aptly aided by the strumming of do-tara (a two-stringed musical instrument) in between, Burmanda had enhanced its overall impact. The simple lyrics, penned by Shailendra, are highly philosophical and yet very touchy: Kehte hain gyaani (The wise say) / duniyaa hai faani (this world is mirage) / paani pe likhi likhavi (everything is written on water) / hai sabki dekhi (it is seen by all) / hai sabki jaani (experienced by all too) / haath kisike na aavi (yet, no one could hold it) / kuch tera na mera (nothing is yours nor mine) / musafir jaayega kahaan (where will you go then, O traveler) … I love the song for its simple words that echo pain, pleasure, anguish, misery, hopelessness and whatnot of Raju or …. 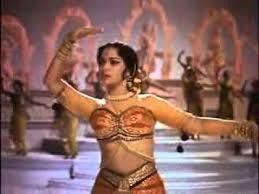 The other loveliest song of the movie is Rafi’s “Tere mere sapnae / abb ek rang hain…” penned by Shailendra. Here too we hear Manohari Singh playing matching pathos from his saxophone — listening to the pathos poured out by Rafi … intermingled with saxophone and violins … is an experience in itself that one simply cherishes listening on and on. begins with Rafi’s voice slowly pouring out Raju's heart... Tere mere sapnae so touchingly, we see Raju and Rosie in the center of the canvas … just two of them, that too, their bust only. And remember, all this in the dusk. You only have to imagine its impact on the underlying pathos of their romance. To better appreciate the whole scene you must first know that Rosie, the heroine, deserting her husband, has just walked out of his life and tells Raju, “Raju, main bahaut dukhi hoon… har taraf andhera”(Raju, I am terribly sad… I am encircled by darkness) … and of course, Raju, the hitherto carefree person, comforts her by holding her close. And the song we are talking about follows. Rosie is in his hold, of course, with much discomfort, for she is obviously undergoing a terrific intra-conflict, but no sooner does he finish singing, she releases herself and walks away with her fist held tightly — the reason being, having just walked out of her husband resolutely for ever, she is perhaps still not sure of her future—while Raju, perhaps, in respect for her dilemma, remaining where he is, stretches out his hand for her to join him, and the camera tracks Raju’s outstretched hand without any break, taking it to one end of the screen, and then the camera moves back to track Rosie without letting any gap creep in, and tracking her on the other end of the screen, lets us notice Rosie staring at him, face writhed with anguish, then slowly moving towards him — by then she might have resolved her conflict — as she hugs him, the camera gets the pair come on to the center of the screen again and Raju completes airing the rest of his assurance: lakh mana le duniya, sath naa yeh chhutega / Aake mere hatho me, hath naa yeh chuutega / o mere jivan sathee … holding her tightly in his embrace. What a winsome picturization! It is to be seen and enjoyed; I cannot put it in words so expressively. 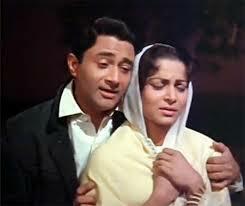 The other most favorite song of mine from the movie is a sad melody: “Din dhal Jaaye haye raat na jaaye,” for the sheer pathos that poured out from that mellifluous voice of Rafi. 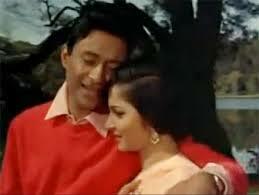 Indeed I am crazy of even Dev’s dialogues preceding the song —“Kohi Hai”, Dev Anand in his usual style. Then the boy: “Kya baat hai sir, aaj aap bahaut pee rahe hain?” Raju, again in his usual rat-a-tat style: “Zindagi bhi ek nasha hai dost. Jab chadhta hai to poocho mat kya aalam rehta hai… lekin jab utarta hai, — for they elevate the mood of the listener and prepare him for the song that follows. This hypnotic song begins with a soft alaap … Hmmmmmm … Din dhal jaaye haye, and the hallmark of the song is the way Rafi renders haye … then, like its parent raga Yaman-kalyan, the song flows to fathomless bottom to quarry viopralamba shringar, duly supported by matching lyrics: Dil ke mere paas ho itne phir bhi kitini door (You are so close to my heart and yet so far away) / Tum mujh se main dil se pareshan, dono hai majboor (You’re troubled by me and I’m troubled by my heart, both are helpless) / Aise mein kisko kaun manaaye (In such a situation, who can comfort whom) … The lyrics delivered in a very low voice by Rafi to the accompanying equally soft orchestration, particularly flute … all cumulatively make the listener go along with the song in the same mood … haunt the listener even after turning off the box, for they are so pregnant with dense philosophy. This extraordinary impact is certainly more due to the simplest words chosen by Shailendra that convey the mysteries of life very effectively. 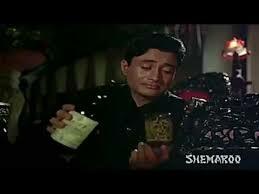 Simply put, the music, lyrics, dances, and performances of Dev Anand and Waheeda Rehman, particularly her colorful dance movements, Vijay Ananda’s direction — everything meld so well that the film remains a landmark in Indian cinema. I have been listening to these songs for about 50 years now, and no matter how many times I listen, I never get tired of them. For that matter, even the other songs — “Kaanton se kheench ke ye aanchal”; “Saiyan Be-imaan; kyase kya ho gaya bewafa tere pyar me”; “Piya Tose Naina Laage Re” — are equally pleasant to listen to. There are so many memories associated with Dev Anand, his film and the songs … my roommate and I used to talk at length into the nights about Dev’s hats, scarves, stiff shirt collars, his diagonal walks — watch how he leads Rosie holding her with one hand and with scarf dangling from the other hand while cooing Gatha rahe, his caressingly putting his hand over her shoulders, and whatnot…. Well! Beet gaye din, pyarr ke palchhin / sapna bani wo raatein.